Peoples’ versions of their ideal person vary from individual to individual, but usually their idea of the ‘perfect person’ is influenced by what is most popular in society. This character has wide hips but narrow shoulders, which creates an exaggerated triangle shape with her body, particularly when coupled with the wide chiffon skirt. Triangles are the sturdiest shape, which gives her the appearance of appearing very grounded. Standing ones’ ground is an important part of war, which is what she is a ‘goddess’ of- war and earth. Along those lines, her name is Gina. As the legend is very old, no one is certain as to her full name- ‘Gina’, meaning ‘well born’, ‘Georgina’, meaning ‘earth worker’, or Luigina, meaning ‘famous warrior’, which are all names that fit. 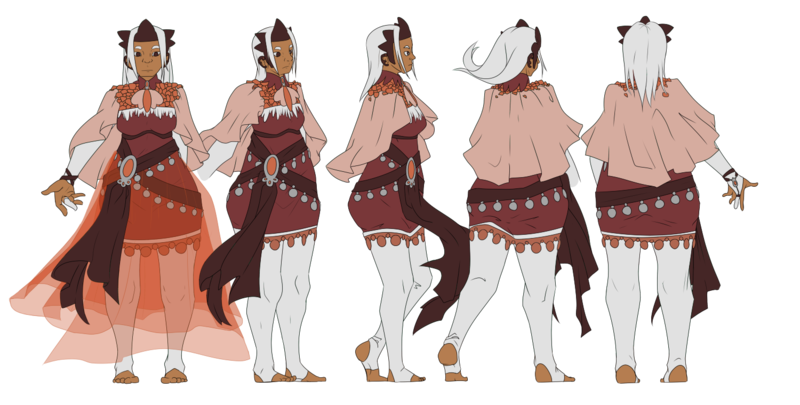 I chose earth tones, like red and brown, for her colors, as those are ‘earth’ tones, and colors that medals may come in for the metal parts. After all, victors tend to receive medals after their victory. In present day, some pieces of the story are blurry. Some say that there were other dragons fighting in the war; others tell that the goddess refused to help at first. As it’s only part of a religion, no one’s really sure if it actually happened or not, but there is something- in modern day, the country’s people tend to have bodies with wider hips and narrower shoulders. This entry was posted in Non Time-Based and tagged 2784px x 5000px, Canon Character, Digital Art, Figure and Motion. Bookmark the permalink.